"They shall make an ark of acacia wood," God commanded Moses in the Book of Exodus, after delivering the Israelites from slavery in Egypt. And so the Israelites built an ark, or chest, gilding it inside and out. And into this chest Moses placed stone tablets inscribed with the Ten Commandments, as given to him on Mount Sinai. Thus the ark “was worshipped by the Israelites as the embodiment of God Himself,” writes Graham Hancock in The Sign and the Seal. "Biblical and other archaic sources speak of the Ark blazing with fire and light...stopping rivers, blasting whole armies." (Steven Spielberg's 1981 film Raiders of the Lost Ark provides a special-effects approximation.) According to the First Book of Kings, King Solomon built the First Temple in Jerusalem to house the ark. It was venerated there during Solomon's reign (c. 970-930 B.C.) and beyond. Then it vanished. Much of Jewish tradition holds that it disappeared before or while the Babylonians sacked the temple in Jerusalem in 586 B.C. But through the centuries, Ethiopian Christians have claimed that the ark rests in a chapel in the small town of Aksum, in their country's northern highlands. It arrived nearly 3,000 years ago, they say, and has been guarded by a succession of virgin monks who, once anointed, are forbidden to set foot outside the chapel grounds until they die. One of the first things that caught my eye in Addis Ababa, the country's capital, was an enormous concrete pillar topped by a giant red star—the sort of monument to communism still visible in Pyongyang. The North Koreans built this one as a gift for the Derg, the Marxist regime that ruled Ethiopia from 1974 to 1991 (the country is now governed by an elected parliament and prime minister). In a campaign that Derg officials named the Red Terror, they slaughtered their political enemies—estimates range from several thousand to more than a million people. The most prominent of their victims was Emperor Haile Selassie, whose death, under circumstances that remain contested, was announced in 1975. He was the last emperor of Ethiopia—and, he claimed, the 225th monarch, descended from Menelik, the ruler believed responsible for Ethiopia's possession of the ark of the covenant in the tenth century B.C. 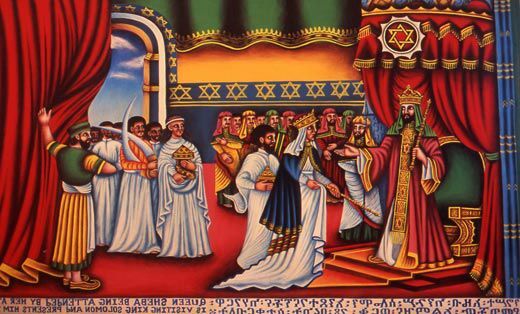 The story is told in the Kebra Negast (Glory of the Kings), Ethiopia's chronicle of its royal line: the Queen of Sheba, one of its first rulers, traveled to Jerusalem to partake of King Solomon's wisdom; on her way home, she bore Solomon's son, Menelik. Later Menelik went to visit his father, and on his return journey was accompanied by the firstborn sons of some Israelite nobles—who, unbeknown to Menelik, stole the ark and carried it with them to Ethiopia. When Menelik learned of the theft, he reasoned that since the ark's frightful powers hadn't destroyed his retinue, it must be God's will that it remain with him. Many historians—including Richard Pankhurst, a British-born scholar who has lived in Ethiopia for almost 50 years—date the Kebra Negast manuscript to the 14th century A.D. It was written, they say, to validate the claim by Menelik's descendants that their right to rule was God-given, based on an unbroken succession from Solomon and the Queen of Sheba. But the Ethiopian faithful say the chronicles were copied from a fourth-century Coptic manuscript that was, in turn, based on a far earlier account. This lineage remained so important to them that it was written into Selassie's two imperial constitutions, in 1931 and 1955. Before leaving Addis Ababa for Aksum, I went to the offices of His Holiness Abuna Paulos, patriarch of the Ethiopian Orthodox Church, which has some 40 million adherents worldwide, to ask about Ethiopia's claim to have the ark of the covenant. Paulos holds a PhD in theology from Princeton University, and before he was installed as patriarch, in 1992, he was a parish priest in Manhattan. Gripping a golden staff, wearing a golden icon depicting the Madonna cradling an infant Jesus, and seated on what looked like a golden throne, he oozed power and patronage. "We've had 1,000 years of Judaism, followed by 2,000 years of Christianity, and that's why our religion is rooted in the Old Testament," he told me. "We follow the same dietary laws as Judaism, as set out in Leviticus," meaning that his followers keep kosher, even though they are Christians. "Parents circumcise their baby boys as a religious duty, we often give Old Testament names to our boys and many villagers in the countryside still hold Saturday sacred as the Sabbath." Is this tradition linked to the church's claim to hold the ark, which Ethiopians call Tabota Seyen, or the Ark of Zion? "It's no claim, it's the truth," Paulos answered. "Queen Sheba visited King Solomon in Jerusalem three thousand years ago, and the son she bore him, Menelik, at age 20 visited Jerusalem, from where he brought the ark of the covenant back to Aksum. It's been in Ethiopia ever since." I asked if the ark in Ethiopia resembles the one described in the Bible: almost four feet long, just over two feet high and wide, surmounted by two winged cherubs facing each other across its heavy lid, forming the "mercy seat," or footstool for the throne of God. Paulos shrugged. "Can you believe that even though I'm head of the Ethiopian church, I'm still forbidden from seeing it?" he said. "The guardian of the ark is the only person on earth who has that peerless honor." 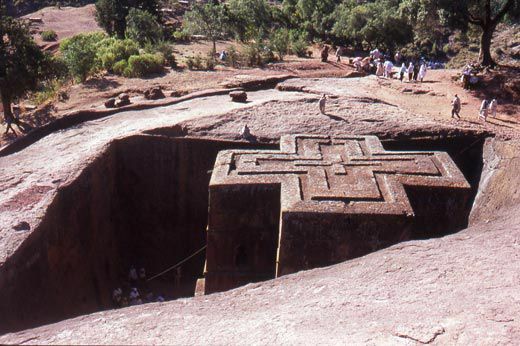 He also mentioned that the ark had not been held continuously at Aksum since Menelik's time, adding that some monks hid it for 400 years to keep it out of invaders' hands. Their monastery still stood, he said, on an island in Lake Tana. It was about 200 miles northwest, on the way to Aksum. Ethiopia is landlocked, but Lake Tana is an inland sea: it covers 1,400 square miles and is the source of the Blue Nile, which weaves its muddy way 3,245 miles through Ethiopia, Sudan and Egypt to the Mediterranean. At the outlet where the water begins its journey, fishermen drop lines from primitive papyrus boats like those the Egyptians used in the pharaohs' days. I glimpsed them through an eerie dawn mist as I boarded a powerboat headed for Tana Kirkos, the island of the ark. Slowly the boatman threaded his way through a maze of tree-covered islands so dense that he began to wonder aloud whether we were lost. When, after two hours, we suddenly confronted a rock wall about 30 yards high and more than 100 yards long, he cried, "Tana Kirkos" with obvious relief. A fish eagle circled and squawked as a barefoot monk clad in a patched yellow robe scurried down a pathway cut into the rock and peered into our boat. 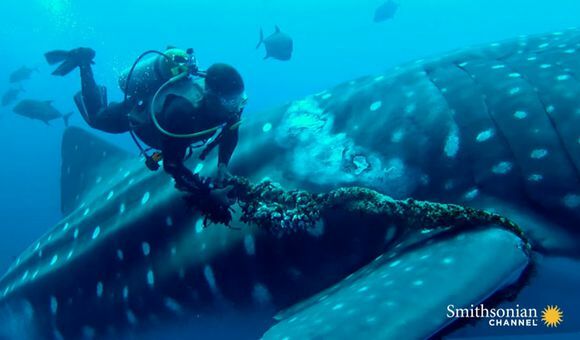 "He's making sure there are no women aboard," my translator said. The monk introduced himself as Abba, or Father, Haile Mikael. "There are 125 monks on the island, and many are novices," he said. "Women have been banned for centuries because the sight of them might fire the young monks' passions." "The ark came here from Aksum for safekeeping from enemies well before Jesus was born because our people followed the Jewish religion then," he said. "But when King Ezana ruled in Aksum 1,600 years ago, he took the ark back to Aksum." Ezana's kingdom extended across the Red Sea into the Arabian peninsula; he converted to Christianity around A.D. 330 and became hugely influential in spreading the faith. Then Abba Gebre added: "The baby Jesus and Mary spent ten days here during their long exile from Israel." It was after King Herod ordered the death of all boys under the age of 2 in Bethlehem, he said. "Would you like to see the place where they often sat?" I followed him up a wooded path and onto a ridge where a pair of young monks were standing by a small shrine, their eyes closed in prayer. Abba Gebre pointed to the shrine. "That's where Jesus and Mary sat each day while they were here." "What proof do you have that they came here?" I asked. 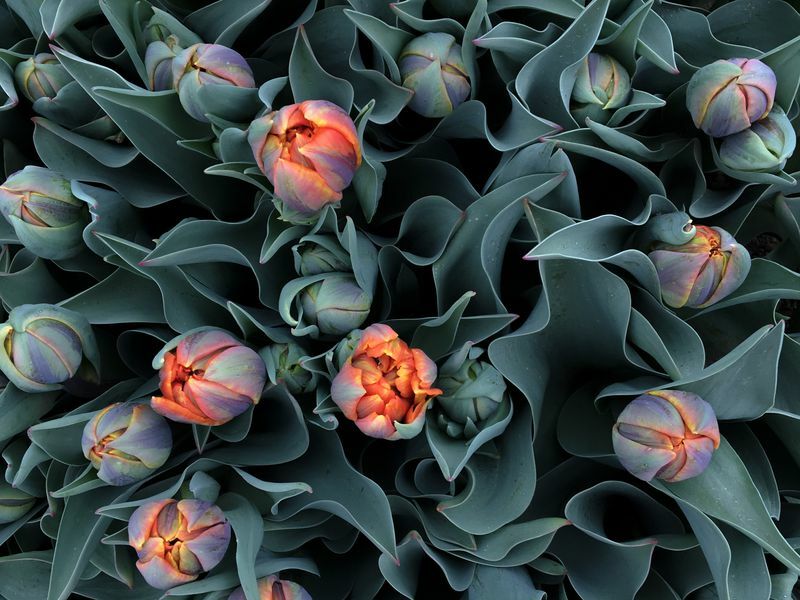 He looked at me with what appeared to be tender sympathy and said: "We don't need proof because it's a fact. The monks here have passed this down for centuries." Later, Andrew Wearring, a religious scholar at the University of Sydney, told me that "the journey by Jesus, Mary and Joseph is mentioned in only a few lines in the Book of Matthew—and he gives scant detail, though he does state they fled into Egypt." Like its former parent institution the Orthodox Coptic Church, the Ethiopian Orthodox faith holds that the family spent four years in western Egypt, Wearring said, in the Nile Valley and the Nile Delta, before returning home. But western Egypt is over 1,000 miles northwest of Lake Tana. Could Jesus, Mary and Joseph have traveled to Tana Kirkos? There's no way to know. On the way back to the boat, we passed small log huts with conical thatched roofs—the monks' cells. Abba Gebre entered one and pulled from the shadows an ancient bronze tray set on a stand. He said Menelik brought it from Jerusalem to Aksum along with the ark. 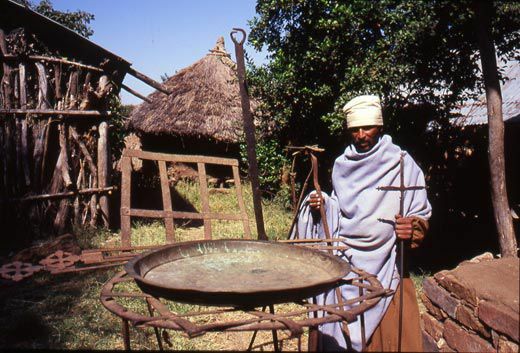 "The Jerusalem temple priests used this tray to collect and stir the sacrificial animals' blood," Abba Gebre went on. When I checked later with Pankhurst, the historian said the tray, which he had seen on an earlier visit, was probably associated with Judaic rituals in Ethiopia's pre-Christian era. Lake Tana, he said, was a stronghold of Judaism. Finally, Abba Gebre led me to an old church built from wood and rock in the traditional Ethiopian style, circular with a narrow walkway hugging the outer wall. Inside was the mak'das, or holy of holies—an inner sanctum shielded by brocade curtains and open only to senior priests. "That's where we keep our tabots," he said. The tabots (pronounced "TA-bots") are replicas of the tablets in the ark, and every church in Ethiopia has a set, kept in its own holy of holies. "It's the tabots that consecrate a church, and without them it's as holy as a donkey's stable," Abba Gebre said. 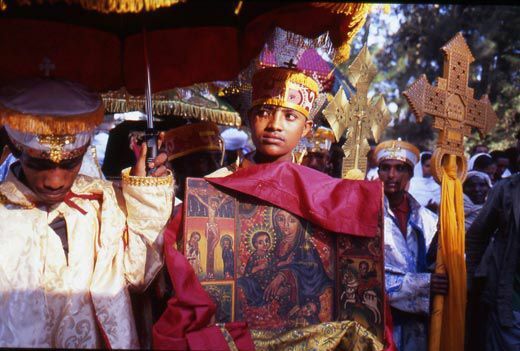 Every January 19, on Timkat, or the Feast of the Epiphany, the tabots from churches all over Ethiopia are paraded through the streets. "The most sacred ceremony occurs at Gonder," he went on, naming a city in the highlands just north of Lake Tana. "To understand our deep reverence for the ark, you should go there." Gonder (pop. 160,000) spreads across a series of hills and valleys more than 7,000 feet above sea level. On the advice of a friendly cleric, I sought out Archbishop Andreas, the local leader of the Ethiopian Orthodox Church. 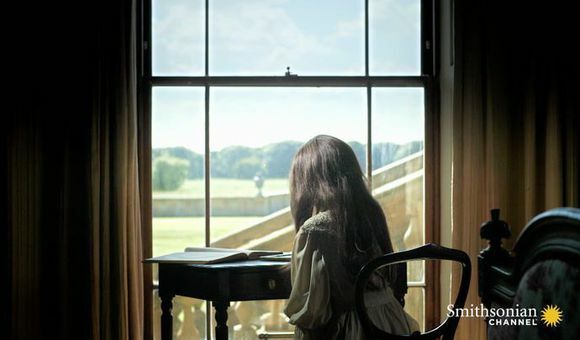 As Andreas ushered me into a simple room in his office, I saw that he had the spindly frame and sunken cheeks of an ascetic. Despite his high position, he was dressed like a monk, in a worn yellow robe, and he held a simple cross carved from wood. I asked if he knew of any evidence that the ark had come to Ethiopia with Menelik. "These stories were handed down through the generations by our church leaders, and we believe them to be historical facts," he told me in a whisper. "That's why we keep tabots in every church in Ethiopia." At noon the next day, Andreas, in a black robe and black turban, emerged from a church on a slope above Gonder and into a crowd of several hundred people. A dozen priests, deacons and acolytes—clad in brocade robes in maroon, ivory, gold and blue—joined him to form a protective huddle around a bearded priest wearing a scarlet robe and a golden turban. On his head the priest carried the tabots, wrapped in ebony velvet embroidered in gold. Catching sight of the sacred bundle, hundreds of women in the crowd began ululating—making a singsong wail with their tongues—as many Ethiopian women do at moments of intense emotion. 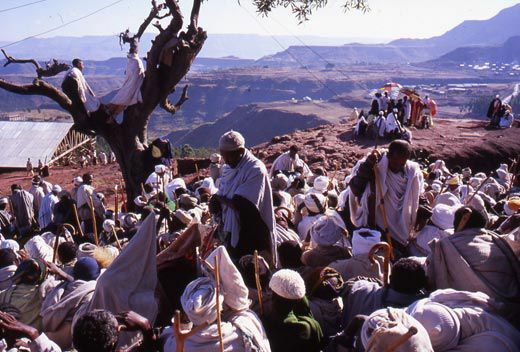 As the clerics began to walk down a rocky pathway toward a piazza at the center of town (a legacy of Italy's occupation of Ethiopia in the 1930s), they were hemmed in by perhaps 1,000 more chanting and ululating devotees. At the piazza, the procession joined clerics carrying tabots from seven other churches. Together they set off farther downhill, with the trailing throng swelling into the thousands, with thousands more lining the road. About five miles later, the priests stopped beside a pool of murky water in a park. All afternoon and through the night, the priests chanted hymns before the tabots, surrounded by worshipers. Then, prompted by glimmers of light sneaking into the morning sky, Archbishop Andreas led the clerics to celebrate the baptism of Jesus by playfully splashing one another with the pool's water. The Timkat celebrations were to continue for three more days with prayers and masses, after which the tabots would be returned to the churches where they were kept. I was more eager than ever to locate the original ark, so I headed for Aksum, about 200 miles northeast. Just outside Gonder, my car passed Wolleka village, where a mud-hut synagogue bore a Star of David on the roof—a relic of Jewish life in the region that endured for as long as four millennia, until the 1990s. That was when the last of the Bet Israel Jews (also known as the Falasha, the Amharic word for "stranger") were evacuated to Israel in the face of persecution by the Derg. The road degenerated into a rutted, rocky pathway that twisted around the hillsides, and our SUV struggled to exceed ten miles per hour. I reached Aksum in darkness and shared the hotel dining room with United Nations peacekeepers from Uruguay and Jordan who told me they were monitoring a stretch of the Ethiopia-Eritrea border about an hour's drive away. The latest U.N. bulletin, they said, described the area as "volatile and tense." The next day was hot and dusty. Except for the occasional camel and its driver, Aksum's streets were nearly empty. We weren't far from the Denakil Desert, which extends eastward into Eritrea and Djibouti. By chance, in the lobby of my hotel I met Alem Abbay, an Aksum native who was on vacation from Frostburg State University in Maryland, where he teaches African history. Abbay took me to a stone tablet about eight feet high and covered in inscriptions in three languages—Greek; Geez, the ancient language of Ethiopia; and Sabaean, from across the Red Sea in southern Yemen, the true birthplace, some scholars believe, of the Queen of Sheba. 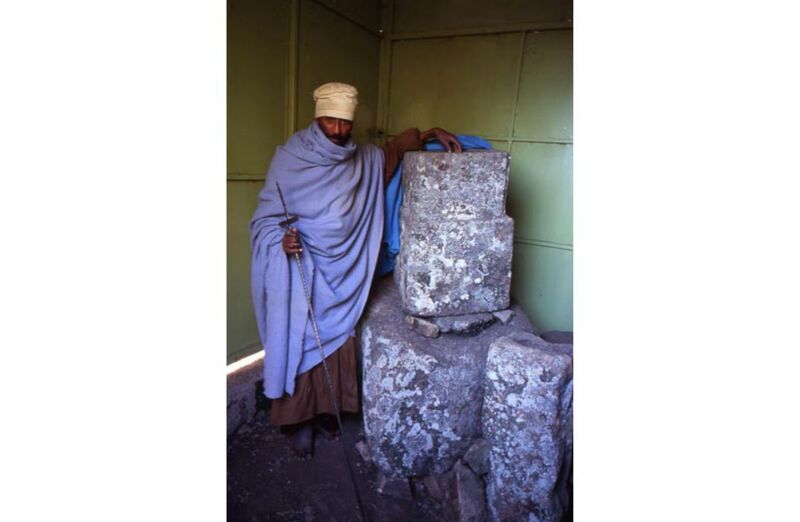 "King Ezana erected this stone tablet early in the fourth century, while still a pagan ruler," Abbay told me. His finger traced the strange-looking alphabets carved into the rock 16 centuries ago. "Here, the king praises the god of war after a victory over a rebel people." But sometime in the following decade Ezana was converted to Christianity. Abbay led me to another stone tablet covered with inscriptions in the same three languages. 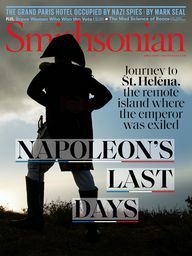 "By now King Ezana is thanking 'the Lord of Heaven' for success in a military expedition into nearby Sudan," he said. "We know he meant Jesus because archaeological digs have turned up coins during Ezana's reign that feature the Cross of Christ around this time." Before that, they bore the pagan symbols of the sun and moon. As we walked on, we passed a large reservoir, its surface covered with green scum. "According to tradition, it's Queen Sheba's bath," Abbay said. "Some believe there's an ancient curse on its waters." Ahead was a towering stele, or column, 79 feet high and said to weigh 500 tons. Like other fallen and standing steles nearby, it was carved from a single slab of granite, perhaps as early as the first or second century A.D. Legend has it that the ark of the covenant's supreme power sliced it out of the rock and set it into place. On our way to the chapel where the ark is said to be kept, we passed Sheba's bath again and saw about 50 people in white shawls crouched near the water. A boy had drowned there shortly before, and his parents and other relatives were waiting for the body to surface. 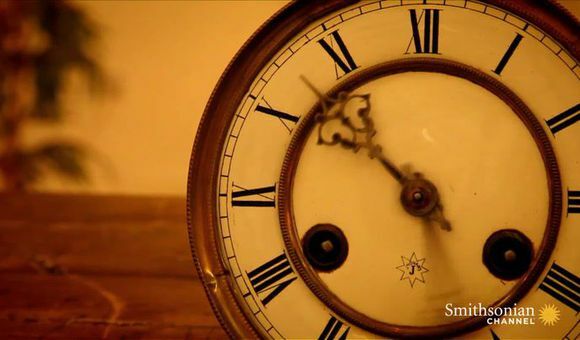 "They say it will take one to two days," Abbay said. "They know this because many other boys have drowned here while swimming. They believe the curse has struck again." Abbay and I made our way toward the office of the Neburq-ed, Aksum's high priest, who works out of a tin shed at a seminary close by the ark chapel. As the church administrator in Aksum, he would be able to tell us more about the guardian of the ark. "We've had the guardian tradition from the beginning," the high priest told us. "He prays constantly by the ark, day and night, burning incense before it and paying tribute to God. Only he can see it; all others are forbidden to lay eyes on it or even go close to it." Over the centuries, a few Western travelers have claimed to have seen it; their descriptions are of tablets like those described in the Book of Exodus. But the Ethiopians say that is inconceivable—the visitors must have been shown fakes. I asked how the guardian is chosen. "By Aksum's senior priests and the present guardian," he said. I told him I'd heard that in the mid-20th century a chosen guardian had run away, terrified, and had to be hauled back to Aksum. The Neburq-ed smiled, but did not answer. Instead, he pointed to a grassy slope studded with broken stone blocks—the remains of Zion Maryam cathedral, Ethiopia's oldest church, founded in the fourth century A.D. "It held the ark, but Arab invaders destroyed it," he said, adding that priests had hidden the ark from the invaders. Now that I had come this far, I asked if we could meet the guardian of the ark. The Neburq-ed said no: "He is usually not accessible to ordinary people, just religious leaders." The next day I tried again, led by a friendly priest to the gate of the ark chapel, which is about the size of a typical suburban house and surrounded by a high iron fence. "Wait here," he said, and he climbed the steps leading to the chapel entrance, where he called out softly to the guardian. A few minutes later he scurried back, smiling. A few feet from where I stood, through the iron bars, a monk who looked to be in his late 50s peered around the chapel wall. "It's the guardian," the priest whispered. He wore an olive-colored robe, dark pillbox turban and sandals. He glanced warily at me with deep-set eyes. Through the bars he held out a wooden cross painted yellow, touching my forehead with it in a blessing and pausing as I kissed the top and bottom in the traditional way. "I'm the guardian of the ark," he said, with the priest translating. "I have no other name." I told him I had come from the other side of the world to speak with him about the ark. "I can't tell you anything about it," he said. "No king or patriarch or bishop or ruler can ever see it, only me. 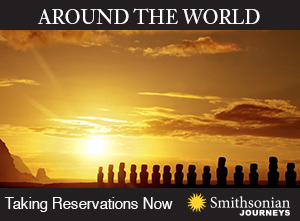 This has been our tradition since Menelik brought the ark here more than 3,000 years ago." We peered at each other for a few moments. I asked a few more questions, but to each he remained as silent as an apparition. Then he was gone. "You're lucky, because he refuses most requests to see him," the priest said. But I felt only a little lucky. There was so much more I wanted to know: Does the ark look the way it is described in the Bible? Has the guardian ever seen a sign of its power? Is he content to devote his life to the ark, never able to leave the compound? On my last night in Aksum, I walked down the chapel road, now deserted, and sat for a long time staring at the chapel, which shone like silver in the moonlight. Was the guardian chanting ancient incantations while bathing the chapel in the sanctifying reek of incense? Was he on his knees before the ark? Was he as alone as I felt? Was the ark really there? Of course I had no way of answering any of these questions. Had I tried to slip inside in the darkness to sneak a look, I'm sure the guardian would have raised the alarm. And I was also held back by the fear that the ark would harm me if I dared defile it with my presence. In the final moments of my search, I could not judge whether the ark of the covenant truly rested inside this nondescript chapel. Perhaps Menelik's traveling companions did take it and spirit it home to Ethiopia. Perhaps its origins here stem from a tale spun by Aksumite priests in ancient times to awe their congregations and consolidate their authority. But the reality of the ark, like a vision in the moonlight, floated just beyond my grasp, and so the millennia-old mystery remained. As the devotion of the worshipers at Timkat and the monks at Tana Kirkos came back to me in the shimmering light, I decided that simply being in the presence of this eternal mystery was a fitting ending to my quest. 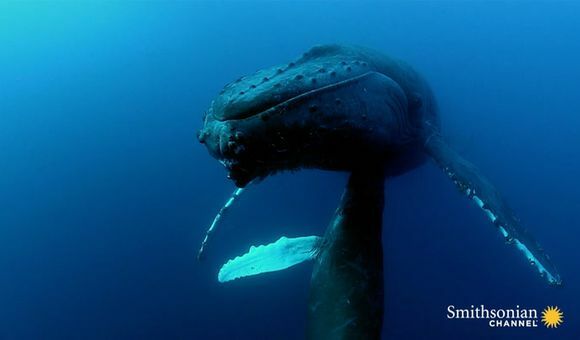 Paul Raffaele is a frequent contributor to Smithsonian. His story on Congo's imperiled mountain gorillas appeared in October.